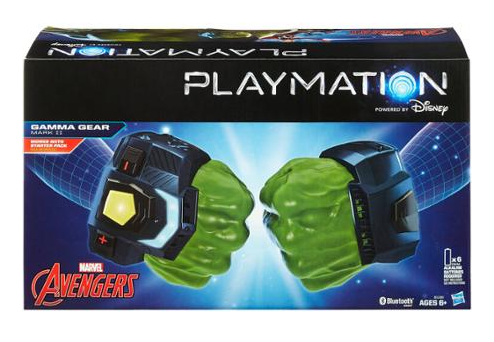 Playmation Marvel Avengers Gamma Gear Just $37.99! Down From $89.98! You are here: Home / Great Deals / Playmation Marvel Avengers Gamma Gear Just $37.99! Down From $89.98! Right now you can get these Playmation Marvel Avengers Gamma Gear for just $37.99 (Reg. $89.98) at Walmart! Load Smart Figures onto Power Activators to bring them to battle (Each sold separately. Subject to availability). X6 1.5v AA AKALINE BATTERIES REQUIRED. NOT INCLUDED. AvengersNet app and content subject to availability. Parent permission required. App works with select iPhone, iPad, iPod touch and select Android devices (see www.playmation.com/devices for details). App is available for download at no cost; some activities require in-app purchase or purchase of other Disney Playmation products. Website not intended for Quebec residents under 13.